The last of the layouts from last week. On Chloes 6 month bday I went photo crazy and I snapped pictures of every bit of her with a page like this in mind. 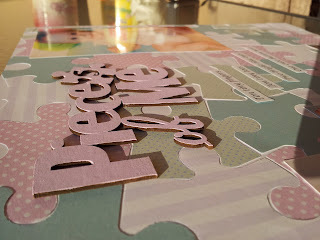 I was originally thinking of using the title 'Elements of Chloe' but when I saw the chipboard in a great scrapbook shop in my hometown I new it would be perfect. I was sure to have a picture of everything that is in the text which I typed and printed in word. I cropped different photos showing parts of Chloe and put them into the same word document as the film strip in yesterdays post and printed them altogether to save wasting photo paper. I created the background by using a puzzle punch on 4 different papers then pieced them together leaving a blank space here and there. I then used a mist to put the '6' in the corner, I thought it was a good subtle way of putting the date on the page. I am happy with the way this page turned out and hope you like it to. very clever, you must have inherited your talent from your mum. lol. LOVE this page Nicole! Too pretty!! 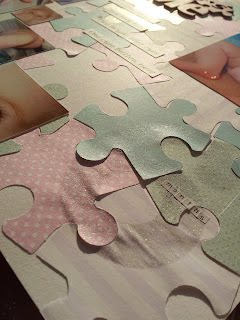 And such a clever idea with the puzzle pieces. Gorgeous!